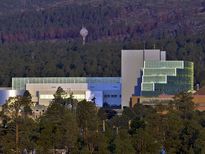 Los Alamos National Laboratory is one of two laboratories in the United States where classified work towards the design of nuclear weapons is undertaken. The other, since 1952, is Lawrence Livermore National Laboratory. 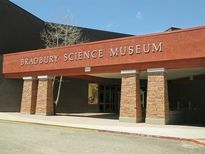 The Bradbury Science Museum is the chief public facility of Los Alamos National Laboratory, located at 1350 Central Avenue in Los Alamos, New Mexico, in the United States. 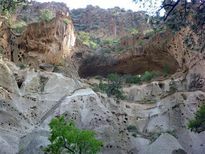 Bandelier National Monument is a 33,677-acre United States National Monument in New Mexico preserving the homes and territory of the Ancestral Puebloans. Most of the pueblo structures date to two eras, in total from 1150 to 1600 CE.